EXTREMELY FINE. 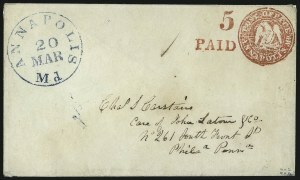 ONE OF TWO RECORDED EXAMPLES OF THE ANNAPOLIS, MARYLAND, POSTMASTER'S PROVISIONAL. ONE OF THE RAREST OF ALL UNITED STATES POSTAGE ISSUES AND OFFERED AT AUCTION FOR THE FIRST TIME SINCE ITS DISCOVERY 117 YEARS AGO. Census No. 2XU1-COV-01. Ex Burger, Castle, Earl of Crawford, Caspary and (possibly) Lapham. Small "W.H.C." handstamp at lower right (Warren H. Colson). With 2011 P.F. certificate. Scott value $300,000.00.